Week 11 of the 2014 NFL season gets started on Thursday, November 13th, 2014 with the Buffalo Bills traveling to take on the Miami Dolphins. For the early day games, the Minnesota Vikings hit the road to take on the Bears at Soldier field and the Philadelphia Eagles travel to Lambeau Field to take on the Green Bay Packers. The Sunday Night Football game sees the New England Patriots traveling to take on the Indianapolis Colts. The Monday Night Football game has the Pittsburgh Steelers traveling to take on the Tennessee Titans. The 2014-15 NFL season is finally here. Here’s is the NFL season schedule for 2014-15 in both printable and HTML formats for you to view, download, and print out if you so choose for the NFL week 11 schedule. 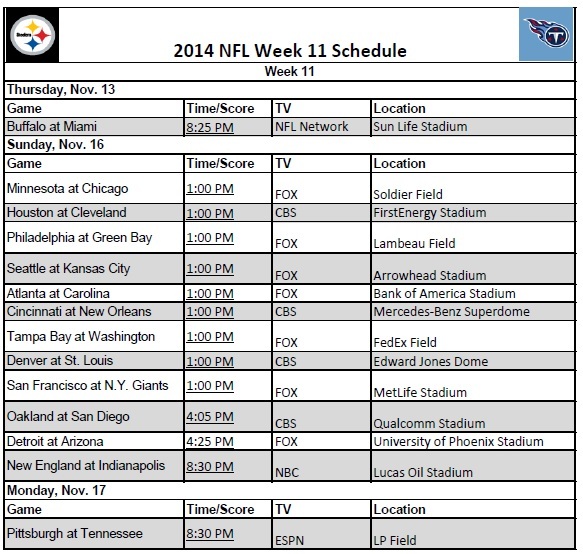 We provide you with a printable NFL schedule in a printer friendly, PDF version.